ANKARA (Hurriyet Daily News) — Turkish Science, Industry and Technology Minister Fikri Isik admitted that the investigation into the murder of Turkish-Armenian journalist Hrant Dink had been delayed, and blamed the “parallel state” for the delay. “We accept that there has been a delay [in prosecuting the murder of Dink] because of the attempts of the Parallel State Structure to shadow the probe,” Isik responding to questions in the parliament on Jan. 19, the ninth anniversary of the prominent journalist’s assassination. Dink, an outspoken activist for minority rights and former editor-in-chief of weekly Agos, was shot dead outside his office in Istanbul’s Sisli district on Jan. 19, 2007 by 17-year-old Ogun Samast, who had traveled to Istanbul from the Black Sea province of Trabzon before the murder. “I underline that no cause can legitimize any attempt on someone’s life. This incident is being worked on with all details,” said Isik. “But nothing remains secret. If we had thought different, we would not make that much effort to investigate all details of this incident and we would not give complete support to the judiciary. At the moment, we want and hope that all related institutions will work effectively in enlightening this incident as well as other unsolved murder incidents,” he added. Isik also added that he wanted to see the instigators of Dink’s murder found and brought to face justice. Relatives and followers of the case have long claimed that government officials, police, military personnel and members of the National Intelligence Agency (MİT) played a role in Dink’s murder by neglecting their duty to protect the journalist. 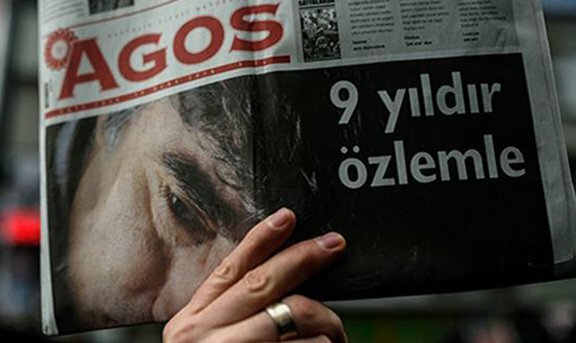 On Dec. 9, 2015, the Istanbul Chief Public Prosecutor’s Office approved the indictment prepared against 26 police chiefs into “negligence on public duty” in the killing of Dink. A total of 26 police officers, including both current and former police chiefs, will be tried as the indictment in the nine-year-long investigation. The indictment referred to U.S.-based Islamic cleric Fethullah Gulen, a former ally of President Recep Tayyip Erdogan and the ruling Justice and Development Party (AKP), who the AKP government now accuses of heading a terrorist organization. The officials currently being investigated were suspected of having links to the Gulen movement. The 26 police officers were charged with one count each of “forming or heading an armed terrorist group,” “membership of an armed terrorist group,” “power abuse on duty,” “manipulating, destroying and/or concealing official documents,” “deliberate murder,” “fabricating official documents by public employees” and “deliberate murder on negligence” in the case filed into public officials at the time of the assassination. All of the 26 were on duty at the time of Dink’s murder. Hakan Bakircioglu, a Dink family lawyer, said on Nov. 4 that not opening a case against former police chiefs Ahmet Ilhan Guler, Celalettin Cerrah, Resat Altay, Engin Dinc and other suspects, would exclude their integral responsibility in Dink’s murder. Good people of Turkey should stand up against Erdogan before he destroys Turkey.